"How are your kids dealing with moving to Guatemala?" This seems to be the question that I get the most lately. It is typically followed by a sideways, squinty-eyed half-smile when I give my answer. And everyone in THIS family will tell you that life with me is an adventure. As we make the leap... I search for things that will connect us to the beauty of our past while also casting our gaze into tomorrow. We have rented Caleb a trumpet for the past two years and I want him to have one to take with him to continue his studies. Last evening I came across one on an internet listing. It was a Yamaha YTR-2335 Standard Bb Trumpet. These sell new for $1,100.00 and such an expense simply isn't in the budget. I have spent the past week scouring pawn shops, second-hand stores, and flea-markets in this scavenger hunt where I imagined myself an explorer searching for a relic. And so it was that when I found this listing for $300.00, I fired off a response that resulted in a 7 hour exchange via text. Finally, at a dark, rainy 10:15 pm my Indiana Jones Adventure found our GPS assisted selves driving slowly up to an old apartment complex in a suburb of Cincinnati. I am a licensed CCW permit holder and I was exercising my 2nd Amendment right. I had $200 snapped in my left side shirt pocket and $100 in the right. Kellie and I stepped into the entryway of the complex and we were surrounded by 5 college age young men. I smiled as I saw a trumpet case resting on the floor and said, "so which one of you have I been talking to all day?" 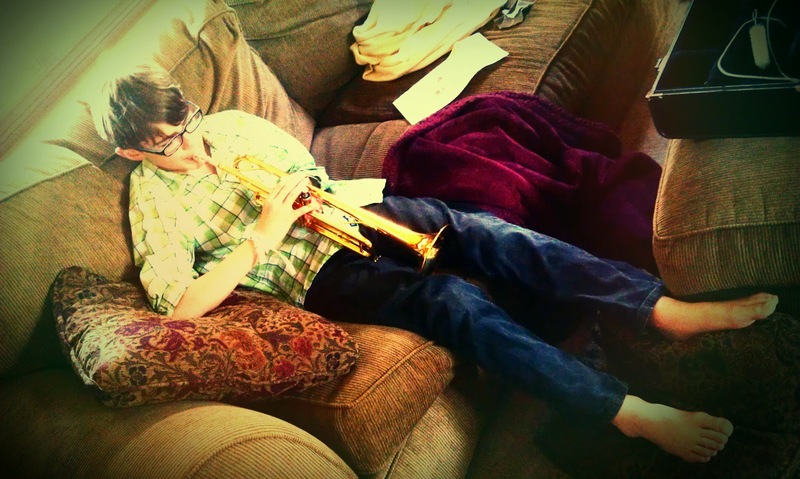 I had texted him our story and explained that I had been looking for a trumpet for my son. He reached down, unlatched the two silver clasps of the hard-cover case, swung the lid open and revealed the shiny brass trumpet. I kept my eyes moving on his buddies and our exit as crazy movie scenes and thoughts of recent headlines played in my mind. He said that he thought we were doing a good thing and knocked the price down to $250. I had all twenties on me and so I told him I appreciated him helping us with the price, assured him that he had helped make a 12 year old very happy, easing his transition to a foreign country... and then told him that I would give him $260. I counted out the contents of pocket one, and then found the balance of $60 in pocket two. Again I thanked him and told him that he was helping us in our mission together as a family. I want his memory of our encounter to be a positive one. Who knows... some day he may again cross our paths, or someday he may be in a position to help others. We left with trumpet in hand, walking out into the rain with the end credit theme to Indiana Jones playing in my head. So how are our kids handling this move to Guatemala? Our kids are phenomenal. Our kids were created by God and called to this purpose. Our kids come from 3 separate nations and are every bit our children. Our family was custom made for this purpose. Sure, we have done everything we could think of to prepare them. We have been careful to give them a solid foundation of strengthening memories. We have made efforts to attach them to friends, spaces, and places that we move towards. We have told them of the epic story of God and those in the Bible that were faithful to His call. We have included them every step of the way and made them part of the process. However... this is not why our kids are ready. Caleb, Aleksandra, and Sterling are ready because God has created them for this moment in life. This bit of short-term-living-ness is simply a moment that prepares us all for our extended timeline. "so most kids form garage bands with guitars and drums, and our son will be forming a Mariachi Band with his trumpet!" Yes indeed! La Banda Mariachi de los Gringos!